End of range, over makes, slight seconds. Ideal for restaurants, catering etc. Candles range from, 8 hour burn time. Excellent burn quality. 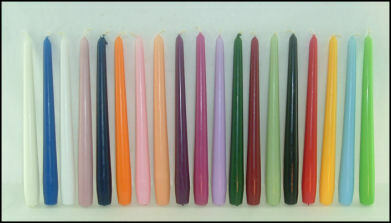 Candles will be in whatever colours, we currently have in stock at time of order, and may be straight and or tapered. Candles may show signs of cosmetic imperfections. Picture guide only. sold singly, assorted colours & sizes only.